Manifesto of an Arteologist (2016) is the center piece of the installation. It is representative of the tattwa Akash, from which all energy emanates. It includes the skylight of The Museo de Arte de Ponce radiating the vibrant energy of the sun; the circular floor piece below with painted African figures riding bicycles and projecting the geometric elements of the tattwas, cowrie shells suggestive of vibrant forces, and the deep black meditative oval of the element of ether. Within a box designed to look like a book are two tablets connected to the internet. 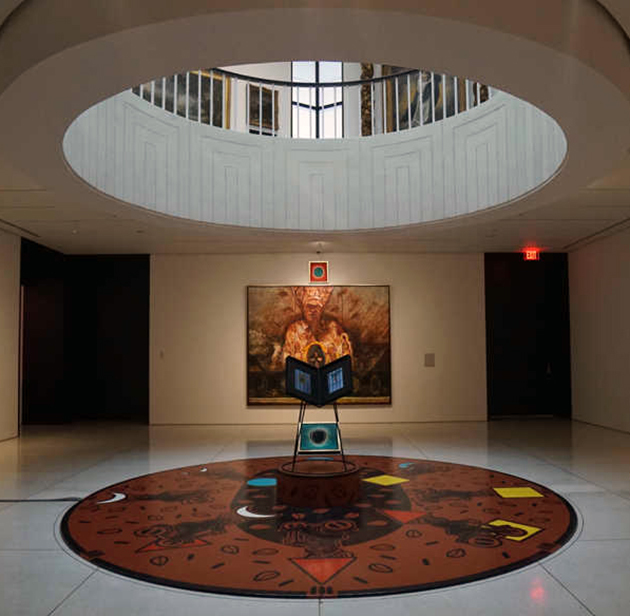 The “book” is placed on a metal pedestal at the center of the floor installation, with a small painting of the oval mounted in the base of the pedestal. The internet pages of this virtual book are themselves a collaborative art/computer science piece co-created with Jorge A. Gautier.